Large dust and debris clouds often obscure the processes at work at the ground. But small tornadoes allow a better view of the processes. If you have examined the video clips of tornadoes on the previous page,you will have seen that the tornado tube forms in a rotating storm cloud,and descends to the ground. Although rotating at high velocity, there is no outflow of air. 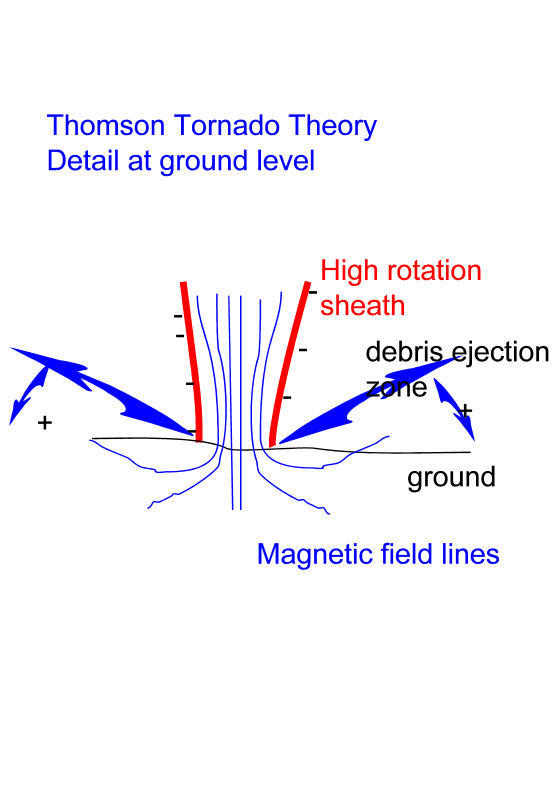 Debris and air is picked up at the base of the rotating core and acceleratesrapidly upwards and outwards. This airflow appears to expand rapidly, with moisture condensing outsidethe central core. It appears as though the central core has a high electrical chargethat induces the opposite charge onto everything near it. The attractiveforces are huge and together with the abrasion of particles rotatingin the sheath it rips the surface from anything it touches. As theseripped off particles start to speed up the particles that were violently attracted are now violently ejected. 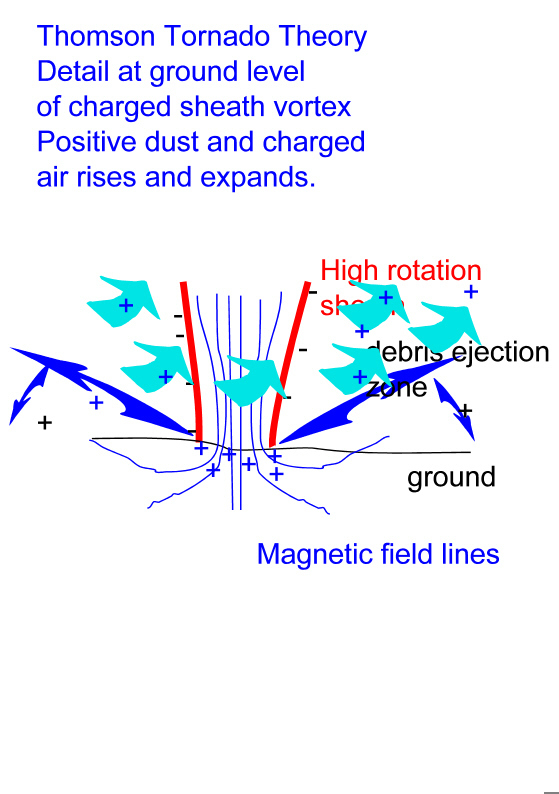 The rising cloud of ejected material accelerates and expands as it does so.This would suggest that this rising airflow is also now highly charged, butnot attracted to the ground or the central core. If you watch a small tornado closely you can see these forces at work. Watch how the opposite charged dust from the ground is thrown out at high speed and then seems to drift downward again. This shows very clearly that at this stage there is almost no airflow coming down the tornado or going up the tornado. See the movie from https://www.uni-stuttgart.de/Wetter/specials/movies/tornado2.mpg Look at the time between 00.03 to 00.06 A small tubular charged sheath vortex is visible inside the larger turbulence vortex. 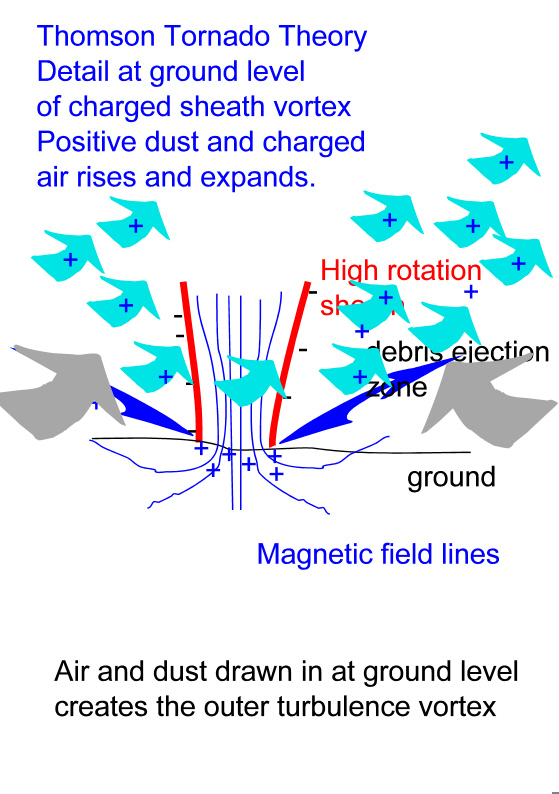 As the ejected charged dust cloud increases, the charge between the dust and the charged air molecules create a pressure that forces the particles apart and reduces the density. This charge induced reduction in density makes the ejection cloud lighter than the surrounding air so it starts to rise. As this dust cloud rises it draws air in from round the base of the tornado, and this rising air may also start to rotate, but at a much slower rate than the charged sheath vortex spinning at high speed inside it. So what physical phenomenon can bring about this pattern of charge? Seethe next page.